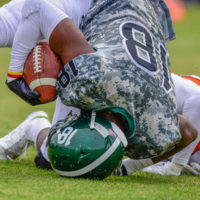 A new study released on January 19th by University of North Carolina and the Centers for Disease Control and Prevention found that brain-injury deaths in high school football players are on the rise. While more and more attention has been given to the incidence of concussions in football players, less research has been done on brain injuries which lead to death in football players in their teens until now. Perhaps most frighteningly, the new study also found that one-fifth of all high school players who experienced a fatal brain injury had also suffered from a concussion less than a month before the fatal injury, suggesting that not enough is being done to ensure that these athletes have a chance to recover after suffering from a concussion and before getting back out on the field. The study also indicates that not only have two dozen high school football players died from traumatic brain and spinal cord injuries in recent years, but the annual death count is on the rise, and college football players are also dying from these injuries. The study found that most deaths were linked to tackling or being tackled (i.e. positions such as running backs and linebackers), and occurred during games. On a positive note, an improvement in medical care and rules banning head-first tackling and establishing helmet safety standards has decreased the number of deaths between 2005 and 2014, as compared to 1965 to 1974. However, there are still far too many young athletes dying in conjunction with high school sports to date, and that number has been on the rise over the last seven years. And what about all of the other injuries–the ones that do not result in death? Researchers have seen changes in brain activity even in the absence of a diagnosed concussion, as well as a lack of any sign or symptom showing that anything is wrong. Specifically, more than half of the players studied showed signs of altered neurological function and changes to the biochemistry and wiring of their brains. Most of the news concerning litigation over brain injuries has covered former NFL players and/or their families filing lawsuits against the league after being diagnosed with chronic traumatic encephalopathy (CTE)–a condition that can only definitively be diagnosed after death– due to repeated head trauma. The lawsuits claim that NFL players were coached to use their helmets as weapons while tackling or blocking. If NFL players are suing for negligence, what does this say about high school football players, who have been placed in similar situations, but are minors who are still in school? Traumatic brain injuries—those that occur before the age of eighteen—can have severe lifelong consequences, sometimes even resulting in death. Minors engaging in high school sports should be able to have some expectation that they are protected; that they aren’t risking their entire futures simply by playing a sport. If you or a loved one has suffered because of a traumatic brain injury, our personal injury lawyers at Friedland & Associates can help. We work with experts in and around Fort Lauderdale to build the best possible case to support your recovery. Contact us today for a free consultation.